Two goals from Lionel Messi helped Barcelona to a 3-0 defeat of Manchester United on Wednesday morning (AEST) and a 4-0 aggregate triumph in their Champions League quarter-final tie. Ole Gunnar Solskjaer named an attacking line-up featuring Anthony Martial, Jesse Lingard and Marcus Rashford, but the blow of those first-half goals seemed to drain any hope of repeating the kind of performance they produced to stun Paris Saint-Germain in France in the last 16.The tie was firmly put to bed by a sublime goal from Philippe Coutinho, who may get the chance to face old club Liverpool in the semi-finals if they see off Porto on Thursday morning. 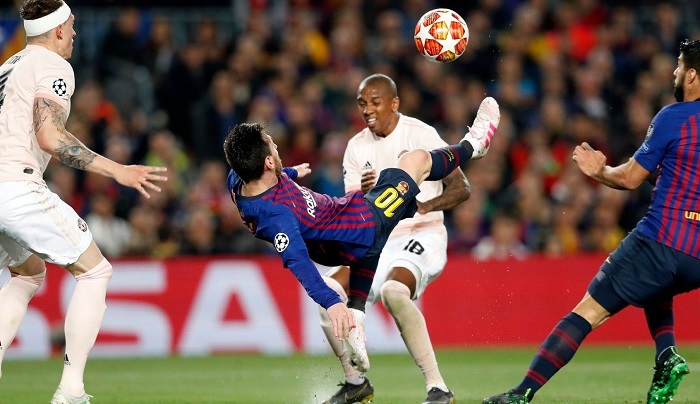 Ashley Young dithered in possession and lost the ball near his own box, allowing Messi to step into space and drill a shot beyond De Gea and into the bottom-left corner.-? The optimism Solskjaer brought back to United appears to have run dry. They started positively but gifted Barca the tie with mistakes, making it eight years now without a semi-final appearance. A return to next year’s competition is no guarantee, either.